Tories have no mandate for what they want to unleash. But to stop them, resistance must go beyond parliament. “The austerity programme needs to be opposed in parliament, but also with industrial action, demostrations and local campaigns”. Photo: Adam Gray. It would hardly be surprising if the large majority of British people who didn’t vote for the Conservatives were daunted at the prospect of what’s now in store for us. David Cameron and George Osborne can hardly contain their enthusiasm for the torrent of cuts and privatisations they are about to unleash. This is to be austerity on steroids. The full gory details of the £12bn benefit cuts the Tories refused to identify in the election will have to wait for next month’s “emergency” budget. But Osborne has already rushed through £4.5bn of new cuts and asset sales to get us all in the mood. And he and Cameron are counting on a punch-drunk Labour frontbench to smooth the imposition of a punitive fiscal regime. To wrongfoot the opposition still further, the chancellor plans to enforce permanent budget surpluses in law. It is, as 77 leading economists warned, a dangerous political gimmick that could help trigger another 2008-style debt crisis. But indefinite austerity, which transfers wealth from public to private and poor to rich, is Osborne’s aim. Under the coalition it brought economic recovery to a halt and had to be quietly shelved even to achieve the faltering growth of the past couple of years. But now they’re going to kick it all off again, just as the Greek crisis is engulfing the eurozone. Opposition to all this has barely begun. But there’s no democratic reason for people to accept it. The Tories were elected by fewer than 37% of voters. Only 24% of those eligible backed the Conservatives – and that’s not counting the unregistered. But the response of Labour’s leadership candidates has been to run a Dutch auction of progressive policies, “swallow the Tory manifesto” and compete to be the most “pro-business”. That’s why the success of the campaign to get the veteran Labour MP Jeremy Corbyn on to the leadership ballot must be welcome. By providing a rallying point for those who want opposition to austerity and endless war, his candidacy should at least halt the mainstream candidates’ stampede to the right – which is taking them further away from the voters they need to win back. The reluctant Corbyn is likely to do better than many media pundits imagine. There’s a clear parallel with the insurgent role of the socialist US Senator Bernie Sanders, currently challenging Hilary Clinton from the left for the Democratic party presidential nomination. Dismissed by the establishment, Sanders has galvanised support from young people with his opposition to corporate greed and support for higher taxes on the rich and military spending cuts – and is now running within 10 points of Clinton in the New Hampshire primary polls. Partly because of the mood Sanders is drawing on, Clinton is having to shift ground on issues such as inequality and “free trade” deals. One way or another, the political establishment cartels have to be broken open if the majority are going to get a look-in. In Britain, last month’s election has been portrayed as a Conservative landslide. It was nothing of the kind. Cameron has a majority of 12 in the Commons – which has already shown itself vulnerable to pressure, despite Labour prevarication – and none in the Lords. The Tories are far from having the wind in their sails. Regardless of the election result, they’re still widely regarded as the creatures of a discredited elite, with no answer to the now almost universally acknowledged crisis of inequality – except to deepen it. They are slashing support for an economy yet fully to recover and which is in no state to withstand renewed shocks. There’s no necessity to put up with the attacks they’re about to launch on millions of people’s living standards, and every reason to resist them. The austerity programme needs to be opposed in parliament, but also with industrial action, demonstrations and local campaigns. That process has already kicked off, with a recent national anti-austerity march in London. If opposition is to be successful beyond particular issues, it will need to become a social movement. But the starting point has to be a break with a post-election sense of public powerlessness. 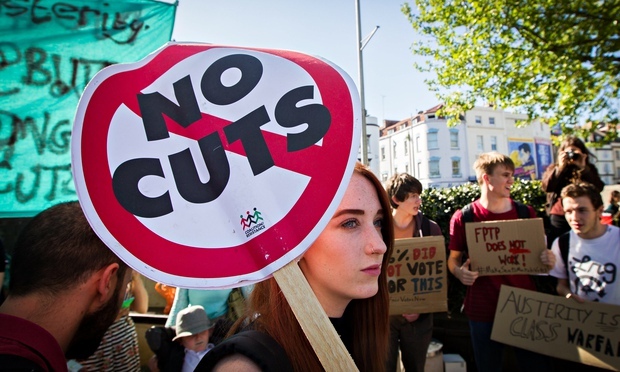 Unchecked austerity is not inevitable. Stronger governments than this one have been forced to change course – and defeated.